My day job involves spending time with about 600 K-6 elementary students. Every day is a new adventure, and there’s never a dull moment! 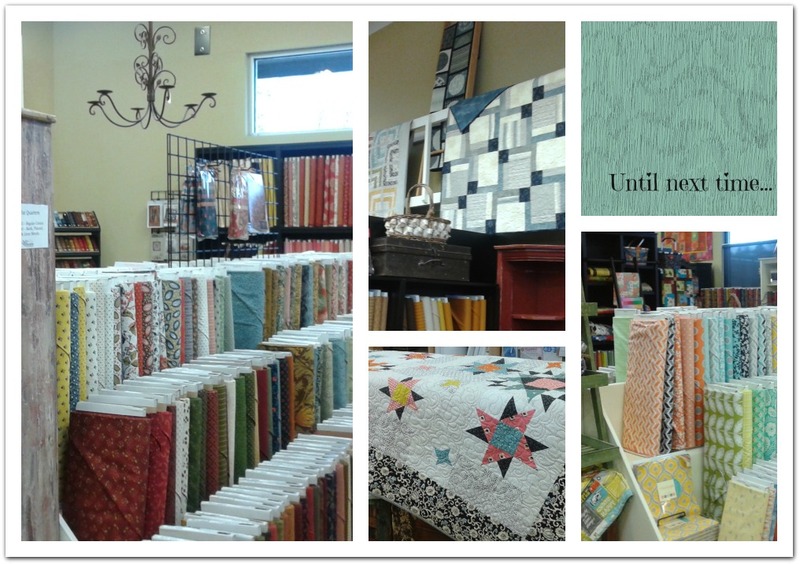 My other job, visiting Quilt Expressions and taking photos, creates the perfect balance to how I spend my work days. 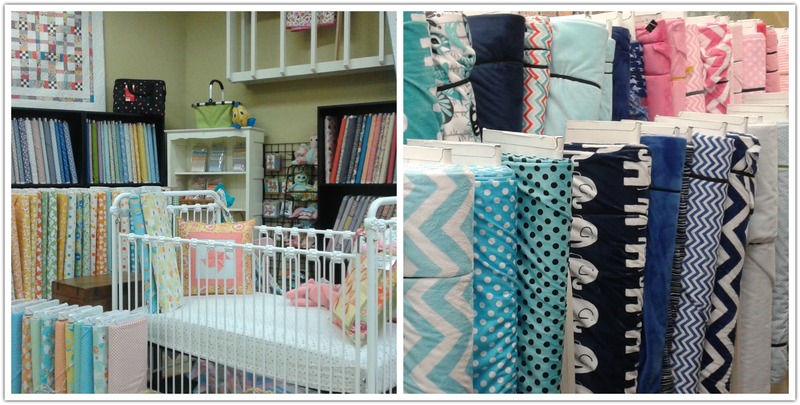 Every time I walk in the store, there are so many new things to see…displays, collections, samples, gift ideas. So much inspiration! Quilt Expressions has sold Reisenthel bags and baskets for several years, and they are very popular with our customers. They are perfect for transporting projects, shopping and traveling. We’ve purchased some fun new styles and prints and can’t wait for you to see them! So many collections! Do you have a young scientist? A sports fan? A kiddo who loves ocean life? Visit our kids’ section to see all of our themed collections. Imagine the possibilities with twelve coordinated fat quarters! Our staff has put together countless Fat Stacks for you to choose from. 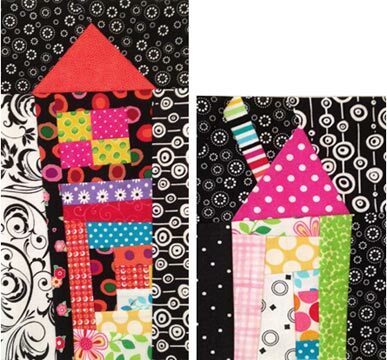 Look around the store for patterns and books that call for twelve fat quarters, choose your favorite Fat Stack and get ready to create! Shhh! I may have snuck in the backroom to see what was on the design wall. Keep an eye out for this gorgeous, cozy kit. Are you looking for a quick gift? Quilt Expressions has quilting-themed grab-and-go gifts throughout the store, kits and fabric bundles, easy projects to craft yourself, and, of course, the best gift any quilter can receive…a Quilt Expressions’ gift card! Visit the store starting the day after Thanksgiving through Christmas Eve for our gift certificate special: purchase a $50 gift certificate and receive a $10 savings coupon or purchase a $100 gift certificate and receive a $20 savings coupon. Savings coupons must be used before June 30, 2018 and some exclusions and limitations apply. Ask any staff member for details. If asked, I’m sure that my husband would probably tell you that I have enough fabric in my stash (especially if he knew where I hide it!). However, certain collections have a way of attracting my attention and then, somehow, falling into my cart. This happened last weekend with Bloomsbury, a new collection for Moda by Franny & Jane. Maybe it’s the fact that winter is just around the corner, but the gorgeous corals, blues and grays make me smile. We’d like to invite everyone to stop in at the store or visit our on-line shop. 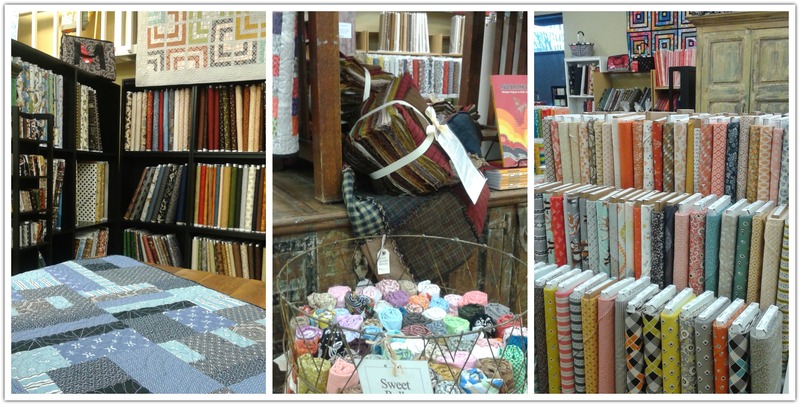 You’ll find a fabulous collection of fabric, patterns, kits, notions, and Janome sewing machines…all surrounded by gorgeous samples and helpful, friendly staff members. I don’t know about you, but I’ve started sewing some blocks into rows. Not complete rows, because that would require that I had a plan and a size in mind! I thought that you might like a little explanation. 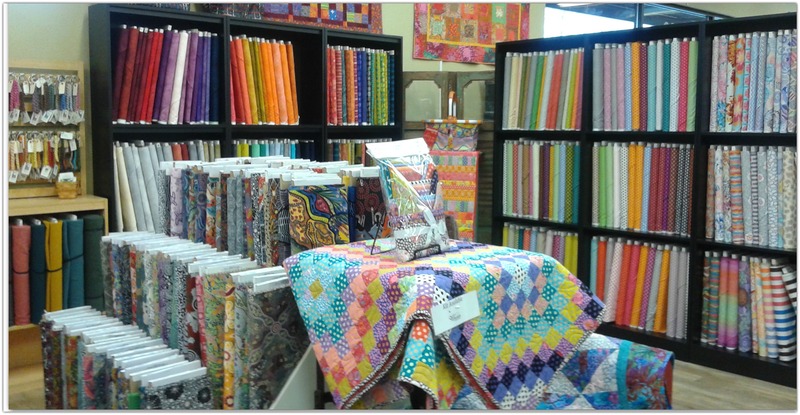 On another note, The Row by Row experience is coming to Boise–and to Quilt Expressions. (If you’d like to visit the Idaho Row by Row Facebook page, and see our “official” row, click here.) 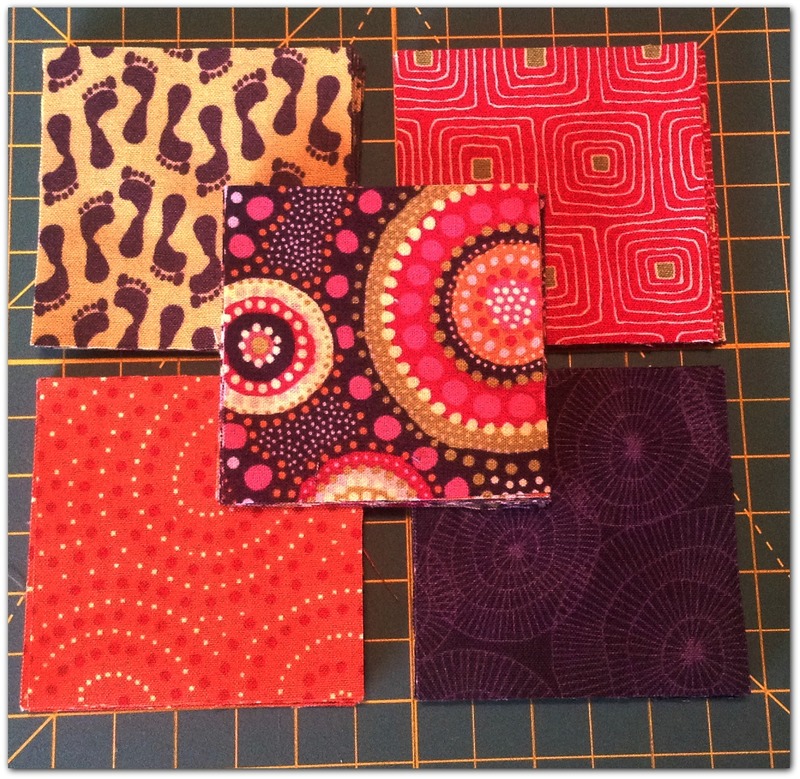 Free patterns for Quilt Expressions’ row will be available in the shop starting June 21. So…in planning our row by row block, I couldn’t help but experiment a little, and of course add the trial “parts and pieces” to my wonky quilt. Here’s where those little black and white checkerboard strips come in handy. I used them to make the house on the left a taller block. Finally, I thought the row was starting to look a little washed out, so I added some columns of color squares. It perks up the row, don’t you think? I’m going to sew these blocks together and we’ll see what happens next! Along with my houses and stars, I made a few ‘X” blocks, just for filler. They’re really simple. I made a few then trimmed them up to 4″ unfinished. I found it worked best if I started with a 5″ square, and then inserted strips that were approximately 7″ long and about 1″ to 1-1/2″ wide, and cut with a bit of an angle. I really love my design wall. It’s so easy to put my parts and pieces up on it, and they stick! Not a one has fallen off and I’ve had them up there all week. I’ve started to play with a few arrangements, but I’m not ready to sew anything together yet. See those big blocks of green under the houses? I’m auditioning some colors for a curvy grass hill. 1. I think some of the blocks are too big. It’s more piecing (more work! ), but I like the look of smaller pieces. Specifically, I think a few of the log cabin type blocks have strips that are simply too wide, and the blocks got too big too fast. Hence the wonky log cabins that turned into houses! 2. I missed with the contrast in the orange/turquoise shoo fly blocks. In other words, there isn’t any! If you’re up close and personal with the quilt you can see the the blocks, but otherwise they get lost. 3. Too many of my fabric choices are muddy or have grey in them. Overall, the quilt is a little darker than I’d like. So this time I’m trying harder to use “pure” color. 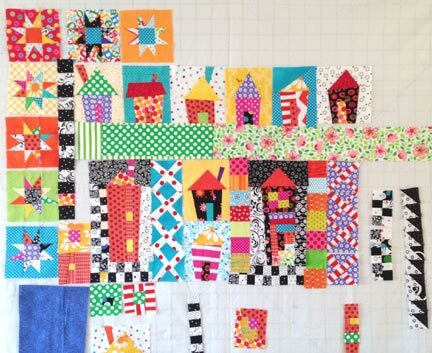 I arranged my blocks in columns in my first quilt. I think that’s an easy way to make everything fit if its the first time you’ve ever done something like this. This time I’m working with rows–not much different–but somehow seems a better fit for my house obsession. 🙂 It’s getting warmer here in Michigan. Thankfully, the snow is almost gone. I was informed by the store that since I’m not as well known as Oprah, I should, perhaps, introduce myself and explain why I am telling you about my bright, save-me-from-winter-grey quilt, from Michigan. My name is Karen (maybe you got that from the first post) Hanson. AKA Mrs. Hanson when I am being particularly ornery. 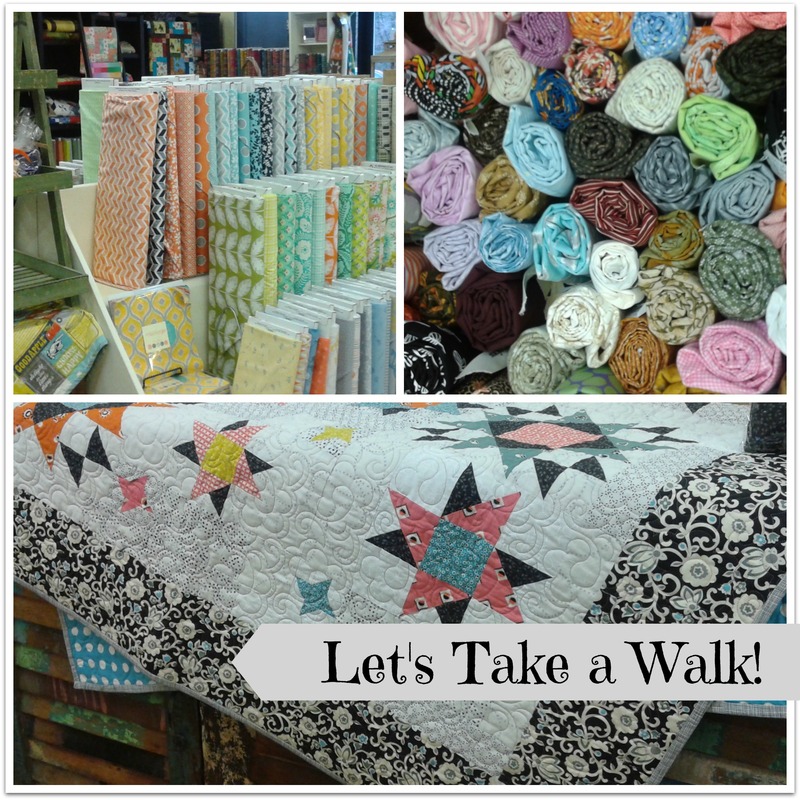 I am the owner of Quilt Expressions (in Boise, Idaho) but I have been living in Michigan since the end of August. My high-school age son is playing on a hockey team here and I got tired of having someone else knowing my kid better than me. So here I am, learning new skills, like how to run a snow-blower! So, all that said, let’s get back to the important things–quilting! 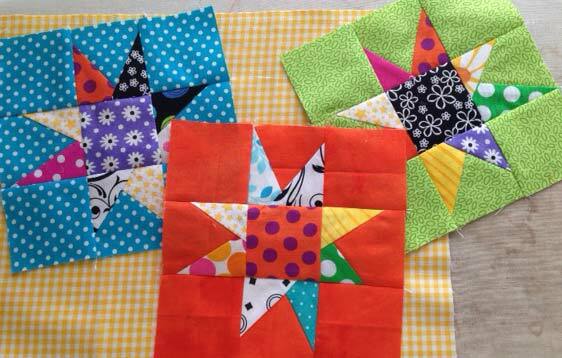 Today I made a few more houses, sewed more black and white squares together, and started on some wonky stars. Right now I’m just in the “parts and pieces” stage, so if you’re sewing along with me just keep making lots of parts. The more parts you have, the more fun you’ll have putting it all together. The star background consists of eight, 2 ½” squares of the same fabric (four corner blocks and four star backgrounds). Star points and one center 2 ½” square should contrast with the background (i.e., if the background is dark, the star center and points will be light, if the background is light, the star center and points will be dark). 2 ½” squares, and the contrasting center square. Four of the background squares will become the star points. On each of the four background squares, place a (approximately) 2″ x 3″ piece of contrasting fabric across the background square at an angle with right sides together. Sew ¼” seam along edge of star point fabric. I drew a line for you to see where to sew. Fold star point fabric over background and press. From the back, use the original 2 ½” square as a guide, and trim up the unit to a 2 ½” square. Then from the front, trim off the underneath fabric (the original square) to reduce the bulk. A rotating mat is really helpful about now! Place another 2″ x 3″ piece across the 2 ½” square – the star point fabric should overlap the star point that you previously finished. Sew ¼” seam along the edge. Fold, press and trim as before. Repeat the process to make four star-point squares. Pictures below show the pressed, but untrimmed star points; trimming from the back; and the trimmed star points from the front. Don’t worry if you cut off a point–or two–and make the stars points different colors and angles. Layout the star in a 9-patch as shown below, and sew rows together. Press the top and bottom row seams toward the outer squares; press the center row seams to the middle.Sew rows together to make a wonky star. Blocks should measure 6 ½” square. Make lots of stars–try different backgrounds–think stripes for example! You can make them larger or smaller–just vary the size of the background and center squares. Tomorrow I’m going to put up my design wall, and make some more “parts”. I’ll be able to put my pieces up on the wall and start thinking about how I will arrange them. What are you going to do? What ever it is, have a great day. How Do I Make a Hexie? I often find that I am working on several projects at once…usually projects that require the sewing machine. However, there are times when I need a portable project. At this time of the year, we spend a lot of time waiting…at the airport, in the car, while the holiday ham bakes, for holiday programs to start. Why not put all of that time spent waiting to good use? 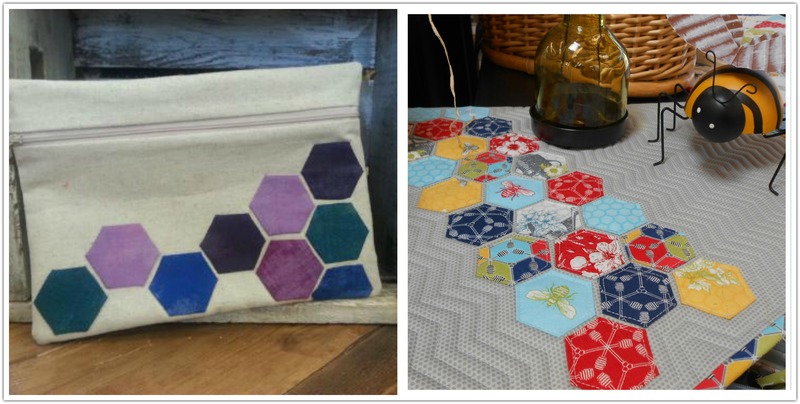 Hexies are the perfect portable project. They take very few supplies to complete. Everything needed can be easily stored in a small container, ready to grab and go. Once you’ve learned the technique, each hexie can be completed in less than a minute. If you have a five-minute wait in the car, you can complete five hexies…more than half of the hexies needed for one of the projects I’ll show you later! They are also the perfect starter project for someone who’s never sewn before. 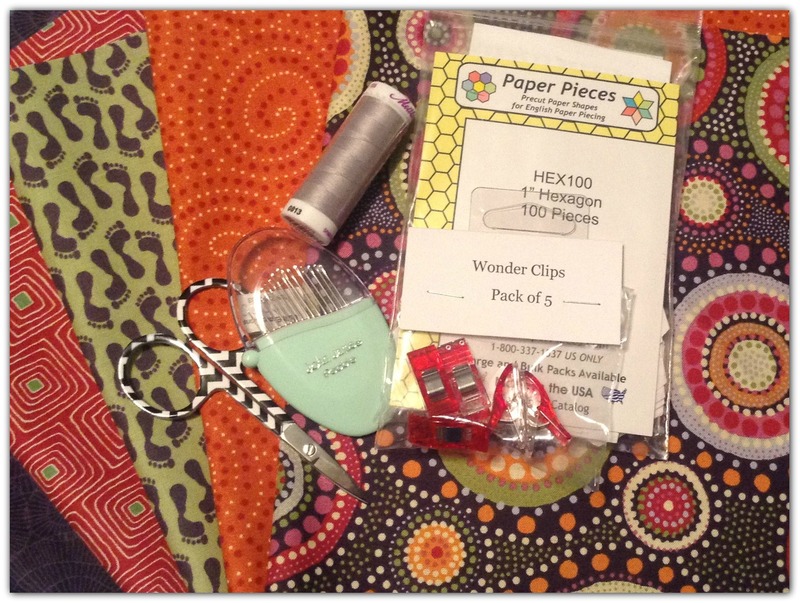 If you’re looking for a fun holiday gift for either a new or experienced quilter, create a hexie project box. My sister-in-law, who has no sewing experience, has found herself forced to take it easy for a while. She’s going a bit stir-crazy and contacted me, asking for a craft project that is easy and doesn’t require expensive tools. I immediately thought of hexies; the items shown above are for her new hexie project box. Now, how exactly do you make a hexie? Gather the following items and you’re ready to start! Photo 1: Hexies come in many sizes. The paper pieces used in this tutorial are 1″. Hexies are measured along the side, not across the width of the entire piece. Most precut hexie pieces come as shown in the second photo. I have found it very helpful to punch a hole in the center of each one with a paper punch. This will make them must easier to remove when you’ve completed the hexie. The first step is to prepare your fabric. If you’re planning on using the hexies as a grab and go project, it’s important to have your fabric precut and ready to be used. If you’re using 1″ precut paper pieces, 2.75″ squares of fabric work best. 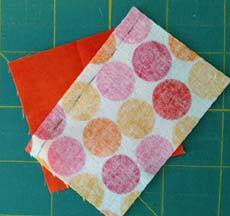 As mentioned before, you can either use scraps left over from other projects or use yardage. 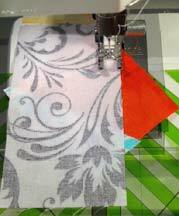 If using yardage, cut a strip that is 2.75″ x width of fabric (WOF). Cut the strip into 2.75″ squares. 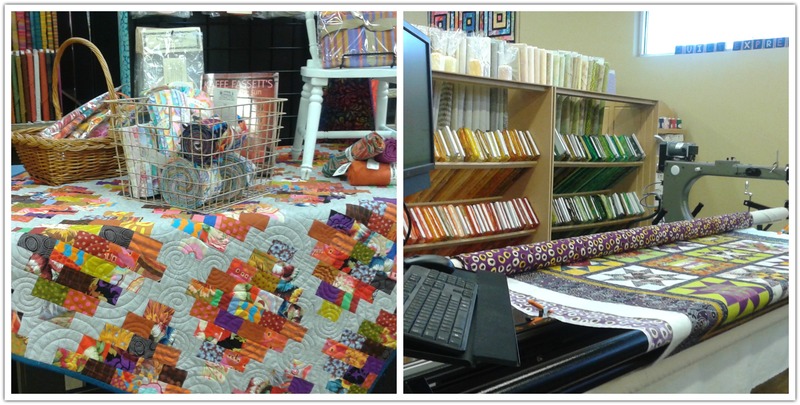 If you have one of Quilt Expressions’ 2.5″ x 6.5″ rulers, this is a very simple process. Lay your fabric strip straight on your cutting mat. Place the ruler along the short end, as shown in photo 1. Because the ruler is 2.5″ wide, simply move the ruler over an additional 1/4,” creating a 2.75″ square. For my sister-in-law’s hexie box, I chose five prints from one of our new collections, Walkabout by Beth Studley for Makower, UK. To get her started, I cut one 2.75″ x WOF strip from each of the five prints. I was able to cut 15 squares from each strip, resulting in 75 squares. 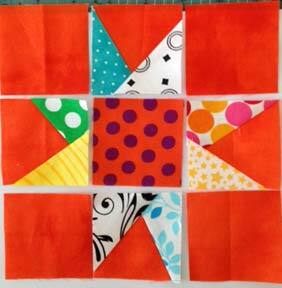 Step 1: Gather one fabric square, one hexie paper piece, and a threaded needle. Place the paper piece in the center of the wrong side of the fabric. Step 2: Holding the paper in place, fold one side of the fabric over onto the paper piece. Step 3: Fold over the adjoining side, creating your first corner. Step 4: Secure the two folds with a Wonderclip. Step 5: Tack the fold together with two slip stitches. Step 6: Fold over the third side of the hexie, secure with the Wonderclip. Stitch. Repeat along sides four and five. Step 6: When you get to the last side of the hexie (photo three above), carefully fold fabric toward the center as before. Be sure that both resulting corners are still tight against the edge of the paper piece. Hold in place with the Wonderclip. Step 7: Stitch the last two folds in place. Step 8: To secure the thread once all of the folds are complete, I find it easiest to wrap the thread around the end of my needle twice (photo 5) and pull the thread tight, resulting in a small knot. Step 9: When the hexie is complete, it will look like the first photo above. To remove the paper piece, insert a pencil (or any pointy object) into the hole in the center of the paper piece. Very gently, pull the paper piece out of the fabric hexie. I find it easiest to pinch a corner of the fabric hexie and pull the paper piece out corner by corner. Once you’ve completed the hexies, what do you do with them? What I love about hexies is you can make 1000’s and make them into a quilt, or you can make 10-30 and add them to a small project as embellishment. 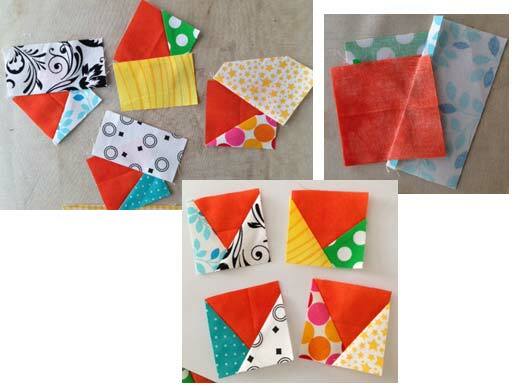 Della added just nine hexies to a pouch made using the “Perfect Pouches” pattern by Lazy Girl. They sure add a bit of personality to an otherwise plain pouch. The pattern is available at Quilt Expressions and also happens to be the perfect size to hold all of your hexie supplies! I had a scrap of grey Dottie fabric left over from a project and added 24 hexies to create a small table topper. The tutorial for the topper can be found here. If you’re looking for additional projects using hexies, simply search for “hexies” on Pinterest. There are many, many ideas using either a few hexies or 1000’s. If you’re creating a hexie project box to be given as a gift, gather all of the supplies needed and put them in a container. If the recipient doesn’t have a rotary cutter or cutting mat, precut the fabric squares for them. Add the link to this blog post, and the recipient will have all they need to get started. Be sure that the container is large enough to hold the completed hexies. 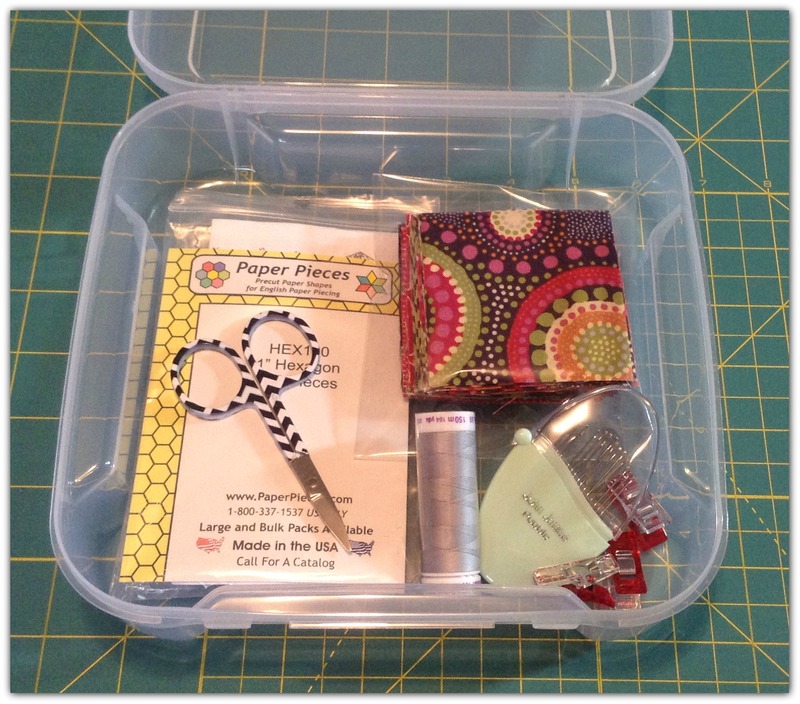 Snack size disposable bags are perfect for storing the completed hexies inside the container.